The pedal box took a bit of cleaning up but it at least is not now detracting from the rest of the engine bay! I gave the box a work over with a wire brush on a drill, followed by some coarse grade wet and dry before coating the whole thing with rust converter gel. 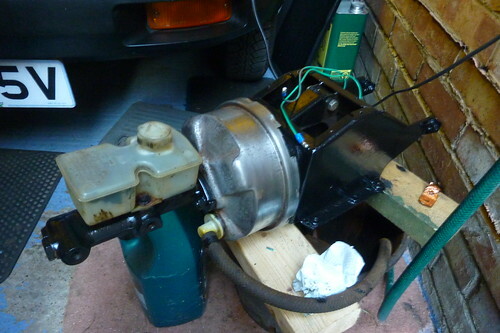 Rinse and repeat (literally), then coat with Eastwood rust encapsulator and then chassis black. The servo got a wet & dry treatment followed by elbow grease and Autosol to get it shiny again. Before I got everything back in I gave the inner wing some treatment and new paint. A new gasket went under the pedal box (to prevent gases from the engine bay seeping into the cockpit). Then there was much bleeding of the brake and clutch lines.